Over the past four years, I've been working on two writing projects at the same time, a new novel, which remains in progress, and a new poetry book, Bird Forgiveness. Although I've been working on the novel longer than the poetry book, the poetry book won out and is in the final stages of editing and production. I wouldn't recommend working on two different books at the same time. I somehow always give into the myth of multitasking. Perhaps, multitasking is a genuine way to get more done at the same time. I don't really know anymore. Sometimes life forces you to get excited about more than one thing. The downside is rooms with piles of books and paper and other scraps of projects left undone because it's challenging to work on multiple items and get them all done to my satisfaction. Add to that a family tragedy like your grandmother dying a slow death to make all of your projects seem overwhelming. The moment when finishing what you've started seems overwhelming, Anne Lamott's 1995 book, Bird by Bird: Instructions on Writing and Life, still holds true. The big takeaway from Lamott's book is the scene when she describes her ten-year old brother having a meltdown because he had put off a report on birds that was due the next morning. He knew he didn't give himself enough time to finish the project and her father helped him out, sat down beside him and put his arm around her brother and said, 'Bird by bird, buddy. Just take it bird by bird'. I'm sure glad Anne Lamott shared that story with the world. The concept is about taking baby steps, breaking a big project down to smaller, more manageable chunks. Take the writing of a novel, for example, and look at it scene by scene, chapter by chapter, sentence by sentence, word by word. This is how a book comes to those traditional lovely last words, The End. 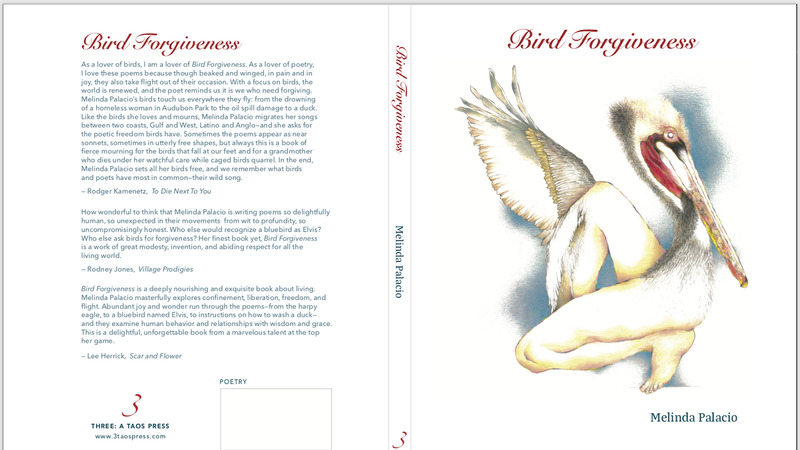 With my book, Bird Forgiveness, the idea of finishing the collection bird by bird doesn't apply only to the writing of the poetry collection, but to life in general. I wasn't concerned with taking on poems about the many different birds. This is a collection of poems that is as much about doing right by birds and the environment as it is about people and human relations, as the title poem suggests. And what has made all the difference is having an editor and publisher, Andrea Watson from 3: a Taos Press, champion this book without putting pressure on me to have a certain amount of poems finished by a particular deadline. Being passionate about multiple types of writing and projects is a good thing. Once a book is finished, you simply can't shelve it and move onto the next project without giving the book another thought. There is still marketing, readings, and workshops to offer in connection with the last book, all the while working on the next book, as well as new poems and stories. However, I can shuffle my tortillas and get my novel to a stage where I am proudly displaying a cover and endorsements. For now, I'd like to share some of the words from three poets who were kind enough to send in their reviews for the book while the manuscript was still in progress and on its way to becoming the forthcoming book, Bird Forgiveness from 3: a Taos Press, coming soon to an independent bookstore near you (alert your favorite bookstores). Where I'll be tomorrow: Beyond Baroque, February 24 for the Nasty Women Poets anthology reading at 4pm. If you're in Venice, say hello. Peter J. Harris follows at 8pm. I can't wait to read it, Melinda.